I thought of this tiny lighthouse when I saw your blog for the first time today. 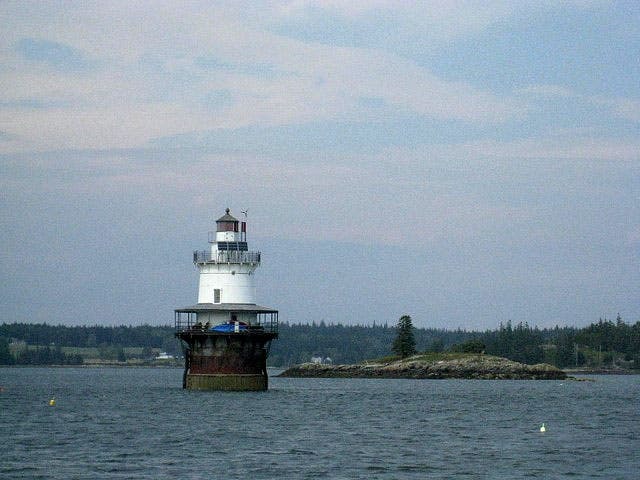 This lighthouse is located in Penobscot Bay, Maine. http://www.lighthousefriends.com/light.asp?ID=539 I was on a schooner cruise (knitting themed) and snapped this photo. 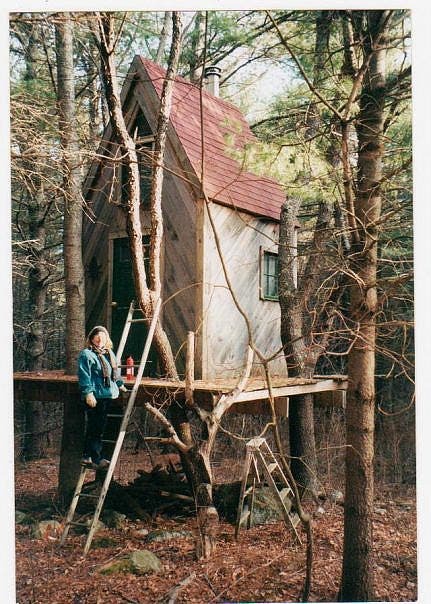 I also built (with my dad’s help) a tiny tree cabin 20 years ago and lived in it for a year. It was 8 ft x 8 ft x 8 ft tall with a sleeping loft under the 8 in rafters. I bought a pile of 8 ft boards that my neighbor had in his yard from clearing the land for his house. The length of the boards guided the design. The windows were salvaged from a local woolen mill that got renovated in the early 1990s. The tree cabin is insulated and has a wood stove on a hearth and a seating area below the loft. I made the stain glass peak windows. There is an outhouse a few yards away. 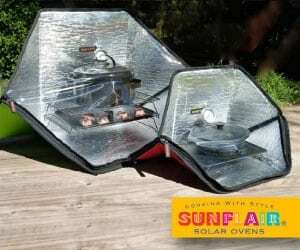 I hooked up a propane lamp and cook top, but never used it. The main house was a few hundred yards away and I preferred cooking and eating with the rest of my family. My cabin is still in the trees, but is a royal mouse house since no one has lived in it for 20 years. I live on the opposite coast and only visit for a week or two a year and haven’t taken the time/money to renovate it, although that is the plan. 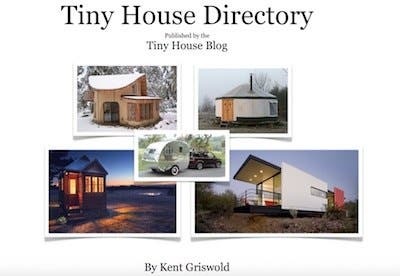 I’m not sure if either of these tiny spaces fit your blog perfectly, but I have enjoyed writing this much about them. Have a great weekend! The school bus that my parents and I lived in while they were building our home in the back woods of Maine in 1973-74. The wood building was the chicken coop. They had taken out the bus seats and put in a mattress, cradle and a wood stove. The stove pipe went out one of the windows. The school bus was gone by the time I was 2, so I don’t remember it. Those are both great. Thanks for sharing. 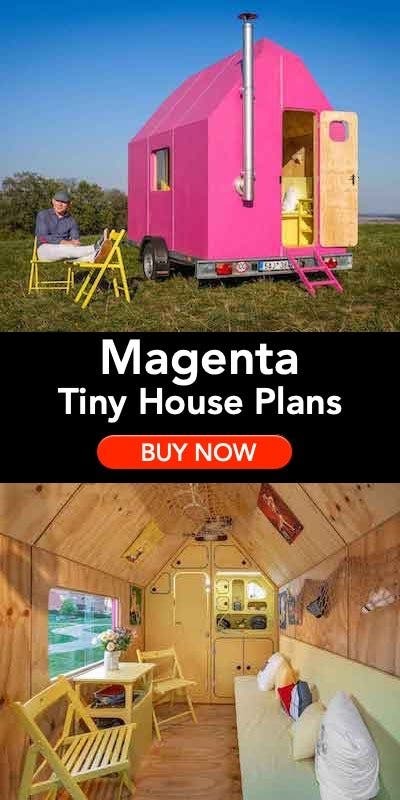 That is awesome I vote we never grow up!This is way to much fun .I think I will light a fire in the stove of my micro house project and make a pot of coffee on it. I can listen to the birds sing in the tree this morning.Watch them thru my picture window.Robins are catching worms and the quail are chasing each other in and out of the tall grass. Bob The cat tail twitching thinks he wants one. 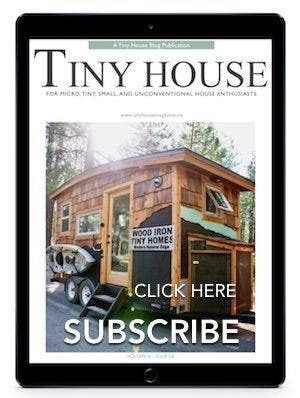 How great that your tiny house still stands & you can at least visit! I grew up living on lighthouses & always wanted to own one so any lighthouse photo catches my eye. Thanks for your contribution. Them mices have it so good in that cute tree cabin! 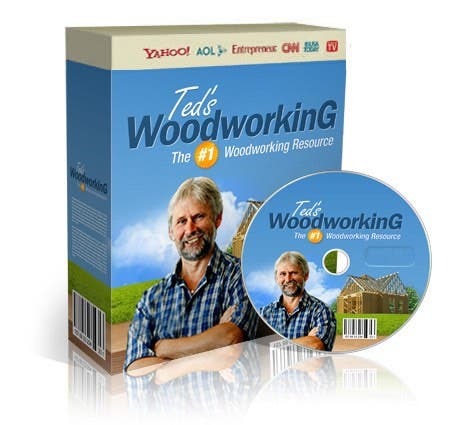 Do they know how to operate the wood stove? Wow. You might consider putting it up on Airbnb. Make the first few clients do some cleaning in exchange for their rent! Heather, I Would like to hear more about what if was like living / sleeping in the cabin for a year. ( very nice btw ). How did this eXperience influence your outlook on life? I’ve pondered forever if it was possible to make a usable 8×8 building… This looks great. This is so beautiful that it makes me want to cry that such a perfect, lovely little house exists (even if just for the mice). I agree with Abel, though, this treasure would be wonderful to find on Airbnb. I would LOVE to rent it for a few days if I ever get some leisure time up that way. Tell me more about the knitting cruise! About to retire, and I have an 8 x 8 x 8 wood mini barn that I would like to move to a little piece land near a lake so I can write and fish – do you think this is doable – It has a single barn door – how can I make it feasible to live in? Any ideas out there. Impressive at any age. Any interior pics? Your home is a jewel! I second the request for interior pics. Heather PLEASE could you write another article about the tree house? I’d love to know more than just the how. How old were you? What motivated you to decide to live in it? How did the rest of your family respond to both the decision and the experience? What made you stop? What did you learn from the experience? And while I want to know about the social side of this experience, being from a cold weather climate myself, I wanted to know how often you had to tend your fire to keep yourself warm (in how cold of a climate)? 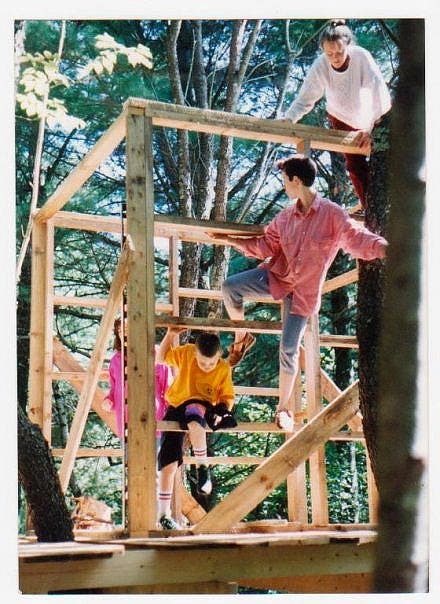 I had tree houses as a kid but I envy you since mine were far less “mature” three season structures. Thanks for sharing. Hope to read more. I loved your house and I love little field mice. At almost 65yrs. I still love the idea of a tree house.Longwood Gardens,Wilmington Delaware has some rather elaborate examples of tree houses if your ever in the area. 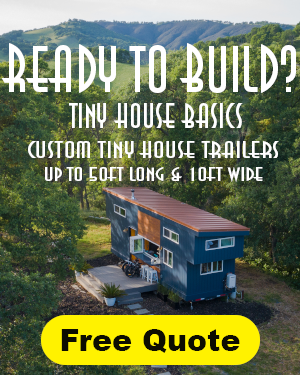 It is my desire to one day be able to build my own cabin. I would also like to see interior photos. We old folks need to be able to live simply. Our tax system is currently killing us and we may all be living in 8×8 structures very soon. Linda D.
I was 19 when I built it with the help of my dad, who was a GC and specialized in energy efficient homes. I had been sleeping outside in my tent every summer since I was 14. My parents were very permissive and I loved the adventure and freedom. I grew up off the grid on an 80 acre homestead in rural Maine. 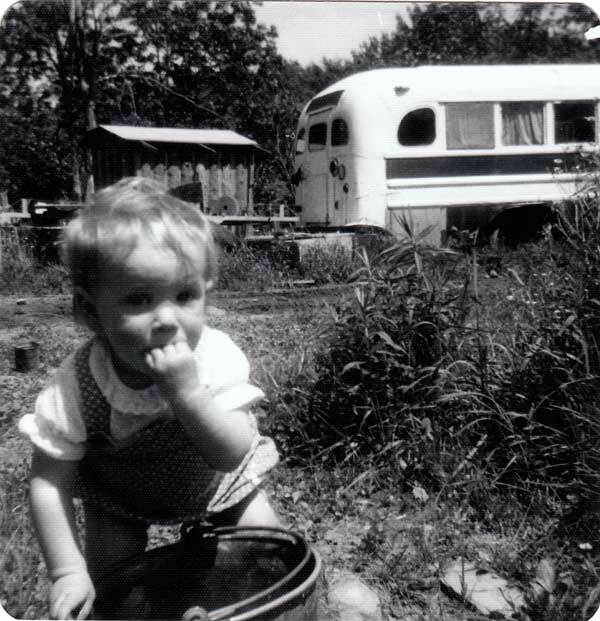 We lived in a school bus the first year of my life, while my folks built the house. I don’t remember the school bus house, but there is at least one photo. I’ll write about that in another post. We replaced the deck about 10 years ago and propped up the supporting cross beams with braces. The deck needs to be replaced again to make room for the trees growing and because the boards are rotting. We didn’t use any treated lumber. The house is supported by cross beams bolted into 2 pairs of trees – 3 cherry and an ash, I think. Our plan was that the trees would push the bolts out, but they grew around them. Unfortunately, I don’t think I have any photos of the interior. I never finished it and it’s very hard to get any kind of a photo taking angle. I didn’t bother lighting the stove after that sauna incident. I would change into my jammies in the big house and walk through the woods to the tree house to sleep. We got four feet of snow in the woods that winter, so I was bundled in tall boots, gators, long down coat, hat, scarf, mittens, etc. I found that it was a bit scary to go into the woods at night by myself. I liked the level of challenge and felt that it was not a dangerous scary, just enough to make my heart race when I heard a twig snap. I didn’t like seeing eyes stare back at me, so I stopped using a flash light. On moon lit nights, it was easy to find my way, but with no moon, it was extremely dark. I would put my arm up about a foot in front of my face and look to the sky to see where there was a gap between the trees and follow the path that way. I was most concerned with getting poked in the eye with a branch of a tree. I had cute back the underbrush along the path, so it wasn’t really that treacherous. The bed was so cold that I would shiver myself silly and start to hyperventilate. The solution was a simple gallon jug (screw top plastic vinegar jug) of hot water. I carried it under my coat and put it in my bed to warm up the blankets and futon while I took my boots off. When I selected the spot for the treehouse, I moved my tent into the flattest part and set it up to get a feel for the location. That first night in the new location, I got a visit from some coyotes. I had been sleeping outside for 4 summers and hadn’t had such a visit. I would hear them howling in the distance, but never up close. There was no way to tell how many were around my tent because they all sang and yipped and howled at the same time. It sounded happy and sad and excited all at once. I was thrilled!! And then they were gone. It was one of those moments that defied time and space. It was my welcome and I felt very approved. During the Spring, I came home to my treehouse one night to find that someone had been in it, eating yogurt, left the empty cups and had been IN MY BED!! Well, this was a terrible invasion. It was very disturbing. I thought maybe it had been the little sister of a friend who lived nearby and had helped build it. I was going to find out who did this terrible thing. My sister delivered the letter to the neighbor at school and I made apple pie. That evening, I waited in my tree house with 2 plates of pie. I heard him coming through the woods. I opened the door and he looked terrified. He told me later that he thought I was going to kill him! I invited him in and we ate pie. I told him about building the tree house. Then I said, “Now that you know the tree house is here and have told all your friends, you are personally responsible to keep everyone away from my tree house.” He never came back and his friends stayed away, too. Haha! I still think it’s hilarious that he thought I was going to kill him – and yet he still came! There you have all my stories. The following year I went off to make my fortune in NYC. I continued to stay in my tree house when I’d come home for visits, but only in the summer. There is a book called Ravens in Winter that can give you a feel for the Maine woods. The smell of the snow melting on the tree bark is what I miss the most. This is a very interesting story, Heather. It is fun to hear more of the details. 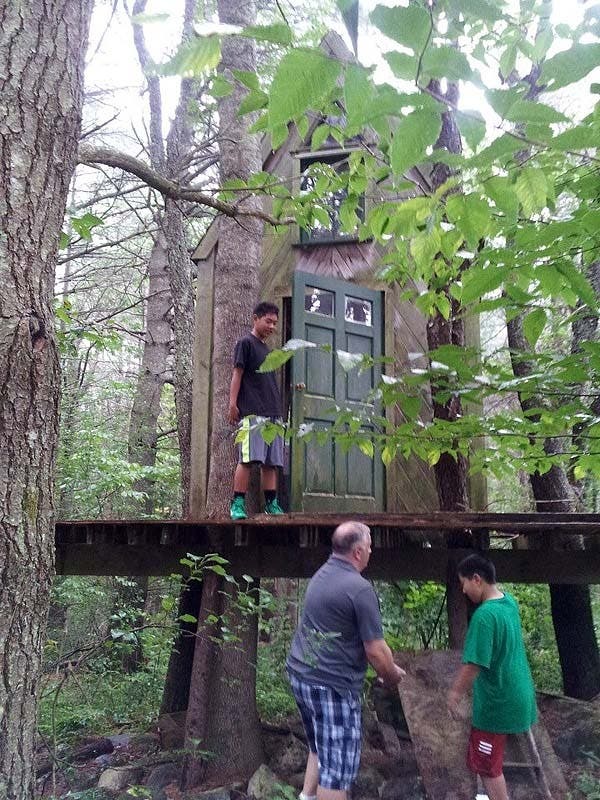 We enjoyed your ambition for building the treehouse and we enjoyed helping to build it. We’ve enjoyed staying in the treehouse and if it were not for the mice we would have used it more. I think your time in the tree house made it easier for you to live in NYC apartments! 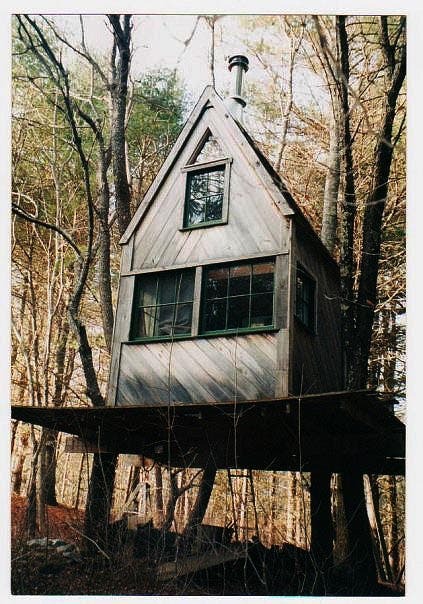 I love the idea of small houses but the treehouse is really only livable as a adjunct to a real house with amenities.